Honey is great for wounds - It has been used for thousands of years because of its antiseptic properties it will clean wounds and inhibit bacterial growth. Because of its natural antibiotic and antibacterial properties it promotes healing, reduces swelling and prevents infections. I keep two jars in my home at all times. One for internal use and one for external use! Alkaline-forming food - This type of honey contains ingredients similar to those found in fruits, which become alkaline in the digestive system. It doesn't ferment in the stomach and it can be used to counteract acid indigestion. When mixed with ginger and lemon juices, it effectively relieves nausea and supplies energy. Raw foodists loves honey for its exceptional nutritional value and its amylase, an enzyme concentrated in flower pollen which helps predigest starchy foods like breads. 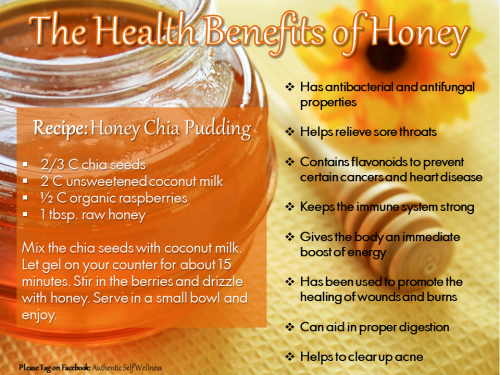 High in Vitamins and Minerals - Raw honey is rich in vitamins and minerals. Vitamin B6, thiamine, niacin, riboflavin and pantothenic acid are common vitamins found in raw honey, although amounts vary depending on the floral source of the honey. Calcium, copper, iron, magnesium, manganese, phosphorus, potassium, sodium and zinc are abundant minerals in raw honey. Antioxidants - Raw honey also contains antioxidants, present in the form of polyphenols, which help fight off free radicals that contribute to many serious diseases. Antibacterial and Antifungal Properties - Honey has anti-bacterial and anti-fungal properties, so it is often used as a natural antiseptic in traditional medicines. Also, the Bible tells you to eat it. So EAT IT! "Eat honey, my son, for it is good; honey from the comb is sweet to your taste."